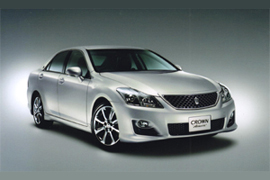 Today, Toyota unveiled the 13th generation Toyota Crown in Japan. It doesn’t look much different from the 12th generation Crown, but it looks a helluva lot different from the first generation Crown from 1955. There aren’t many models in the world that can boast such a long continuous run. Seriously, it’s even outlasted its original marque, Toyopet. Though it’s no longer the king in Toyota’s lineup, having been displaced by Centuries, Celsiors and Lexuses, it remains what it’s always been, a stylish luxury car that is to Tokyo what a pickup truck is to Texas. And most importantly, it’s still RWD. Available engines are all V6s, with sizes ranging from 2.5 to 3.5. Symbolic of our times, a hybrid version is available with the 3.5L motor. This post is filed under: toyota.